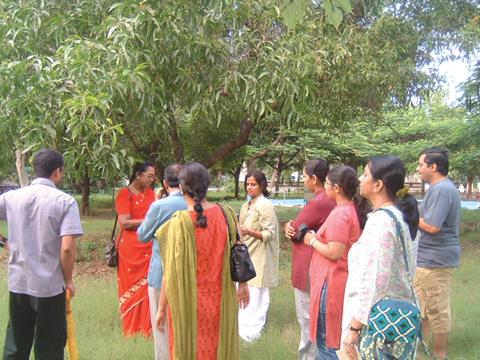 The Tree Walk at the Government Museum, a hit during Madras Week. The sheer number of events simultaneously happening at various parts of city was truly staggering. There were at least seventy public events apart from several private celebrations and, unlike in earlier years, they were completely spread out, from Royapuram in the North, to Taramani and ­beyond in the South and Anna Nagar in the West. In terms of geographical spread, perhaps it was only the presence of the Bay of Bengal in the East which prevented celebrations in that direction! And who knows, perhaps the ships coming in to port may want to join in next year. There were seven exhibitions going on during the week and these varied from those that looked at the past to those that reflected the present and pondered over the future. While some were housed in research libraries and art galleries, the way hotels came forward to exhibit private collections was truly encouraging. The Taj Connemara showcased the historic photographs of Wiele and Klein, while the Taj Coromandel exhibited a truly breathtaking collection of autographs of public personalities of the first half of the 20th Century. A rare collection of lithographs that included unusual views of Madras in the 17th and 18th Centuries was on display at the CP Arts Centre and the number of visitors that thronged to see it was heartening. So was the exhibition centring on the theme of Freedom Movement and Madras which was on at the Roja Muthiah Research Library. A truly pathbreaking exhibition was the one at the Rajaji Hall, which featured the labours of love of several collectors, not to mention organiser Hem­chandra Rao’s coverage of the various facets of the Buckingham Canal in a series of photographs. Two kinds of events that really increased in number this year were the Talks and Walks. While Madras Musings and Chennai Heritage hosted eight in the southern part of the city, the decision to host talks in Tamil in Royapuram in collaboration with Avvai Kalai Kazhagam was a new development. The three programmes held there witnessed good participation from the student community in particular, and the speakers professed themselves delighted with the response. The talks hosted in southern and western parts were all sponsored by way of space and hospitality by schools, libraries, hotels and boutiques and the way these establishments came forward voluntarily was truly heart-warming. There were walks galore featuring heritage, trees, photographs, story-telling and statues. And one Sunday, in particular, the number of those attending heritage walks on the beach truly exceeded those who had come there for their morning stroll! What was amazing was that all walks were fully booked and there was demand for more. Perhaps the time is ripe for continuing walks on a regular basis, week after week. At least four books were released during the Week. One was on historic residences of the city sponsored by a business house of the city and the other was on the Connemara Hotel, brought out by that establishment and chronicling its history. The third was in Tamil and was a compilation of articles written by ten prominent authors on their first impressions of Madras city. The fourth was a reprint of a pioneering work on the early history of the Madras region. There were, besides, storytelling sessions for children and adults, puppet shows, poetry sessions, radio programmes, folk music programmes, food festivals, bike tours, film shows and quiz contests. All this made for a fun-filled and vibrant week, a birthday celebration that everyone in the city will be proud of. It showed a city that, contrary to the picture of apathy that is usually painted, was full of life and the will to celebrate itself. The media, both print and electronic, literally went to town. If one paper carried details of all programmes each day, another covered the events and published detailed reports. All newspapers focussed attention on heritage, civic issues and life in Chennai. Even national television channels sat up and took notice. Is this enough? Definitely not! This may serve as a blueprint for future celebrations but a lot more needs to be done. The participation of schools needs to be increased for children being the future need to be sensitised about Chennai and its history. And the colleges need to be woken out of their lethargy. The shops and malls largely remained outside the ambit of the celebrations and need to be brought in. The IT industry with its technology parks and gated communities needs to be encouraged to celebrate the city. Perhaps this will happen in 2009. And what about an exclusively Chennai-centric film festival? Next year being the 370th year of the city, can we hope for a postage stamp and not just a special cancellation? And will Bharat Insurance Building, based on the Hon’ble Finance Minister’s announcement, be ready, all restored to host an event or two? We live in hope! © 2008. All rights reserved. Madras Musings.